Halloween has changed a lot since I was wee. 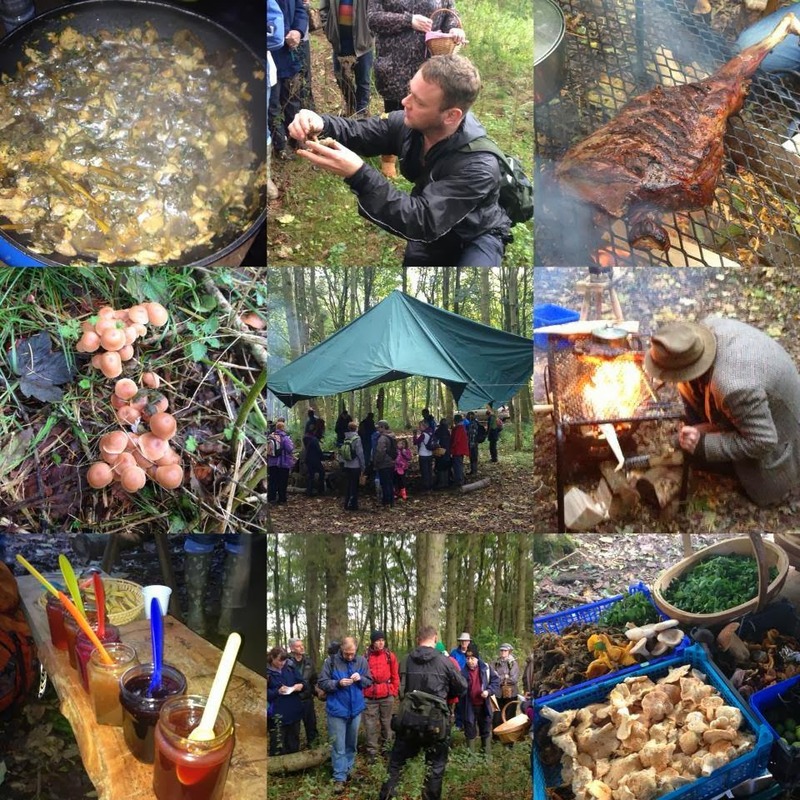 Then it was all about homemade costumes, neeps and guising and not a mention of trick or treating and pumpkins. You had to do a proper turn to get your sweetie. A joke would have had the door slammed on your face. 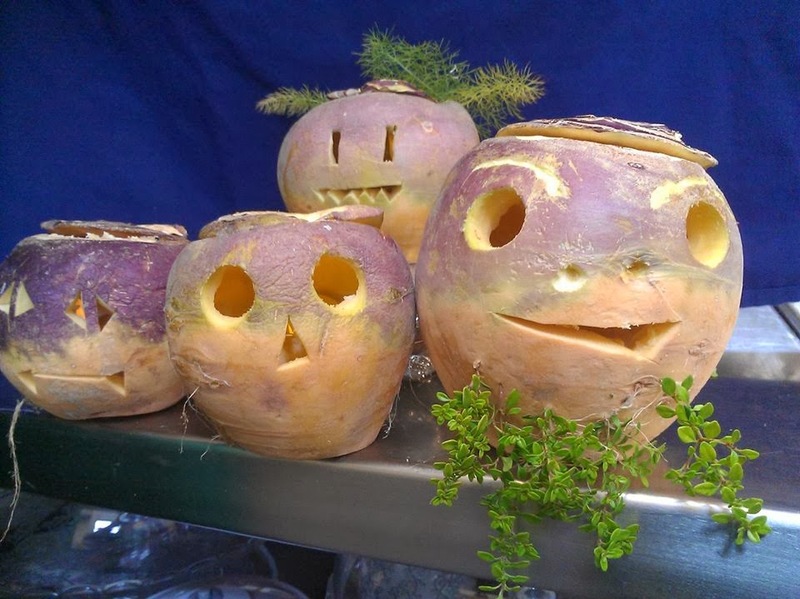 I spotted some proper Neep lanterns on Cool Gourmet's Facebook page so took boy and girl to see them (we had hot chocolate, coffee, irn bru cake, scones and pancakes too) They seemed somewhat perplexed as to why there were no pumpkins in "the olden days" but liked the herby hair and beard. Simplistic carving is the order of the day where neep lanterns are concerned. It takes time and dedication to carve one and the smell of a stubby candle burning the inside of a neep is a childhood memory I would rather forget. 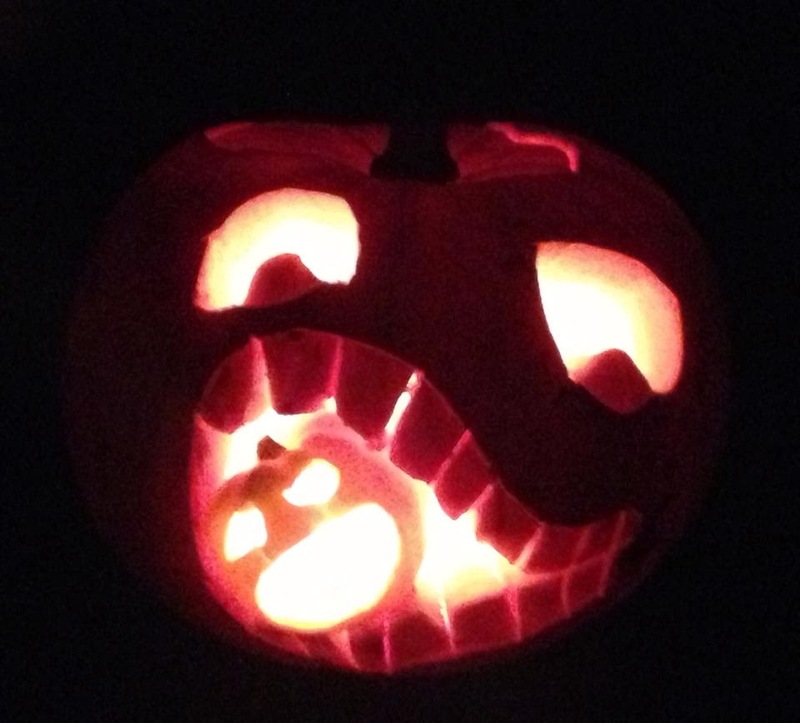 Foodie Loon has been the Pumpkin King in our house in recent years taking on ever increasingly complex creations. Last year we had a ghost and a witch. 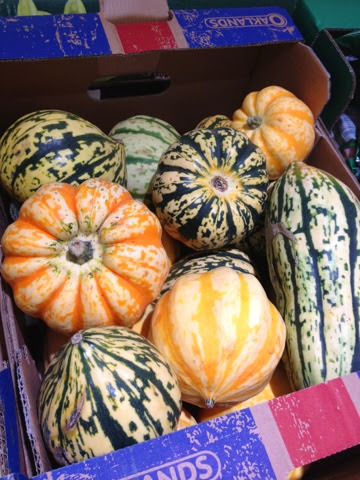 We got the cute mini Pumpkin from Lidl where they had a great selection of unusual squashes in a fantastic array of shapes, sizes and colour combinations. Instructions here if you want to have a go at making your own Cannibalistic Pumpkin. We had a fab Halloween themed Pinnies & Petticoats Cake Club Meet last year which you can read all about in this Spooktacular Blog Post. I made Hot Dog Mummies and Witches Fingers. Lots of inspiration on my Halloween Pinterest Board too. I'll get round to making everything on there some day. 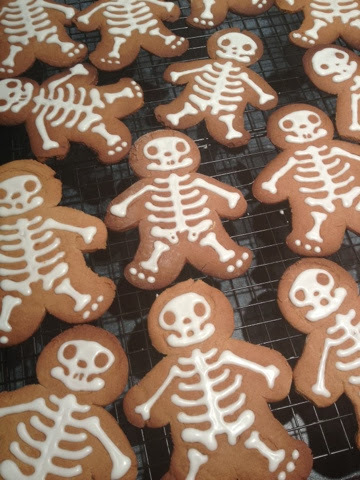 I missed October cake club this year but still baked up some Gingerdead Men. Boy did the baking and I did the icing. We were both really pleased with how they turned out especially as its the first time I've used a pressed cookie cutter. Friends have just returned from a holiday in Canada and brought back some Halloweeny gifts for boy and girl. 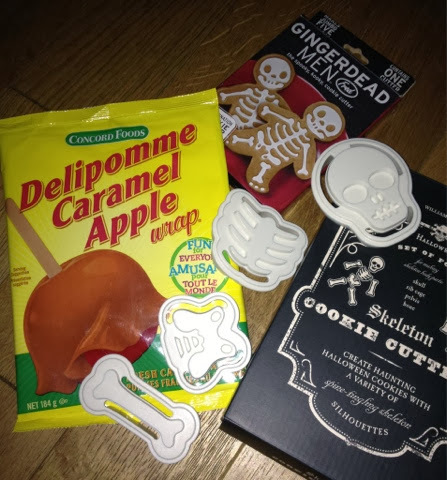 We should be a dab hand at the stamped Skeleton Cookies after our Gingerdead Men and the Caramel Apple wraps look like a much easier and safer way of making toffee apples than boiling red sugar. I've got a huge tub of pumpkin flesh to use up. Much too tasty to sacrifice it all as Jack O' Lanterns. 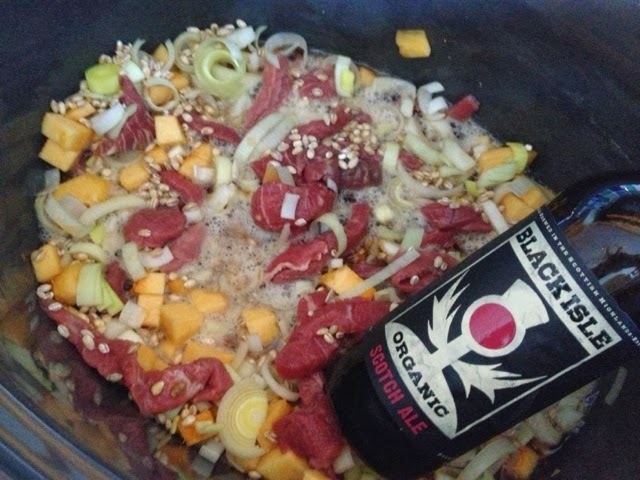 A Beef, Beer, Barley and Pumpkin Stew went in the Slow Cooker yesterday (topped off with doughballs) and Pumpkin Soup and Roasted Pumpkin & Rosemary Pasta are on the meal plan for later in the week. 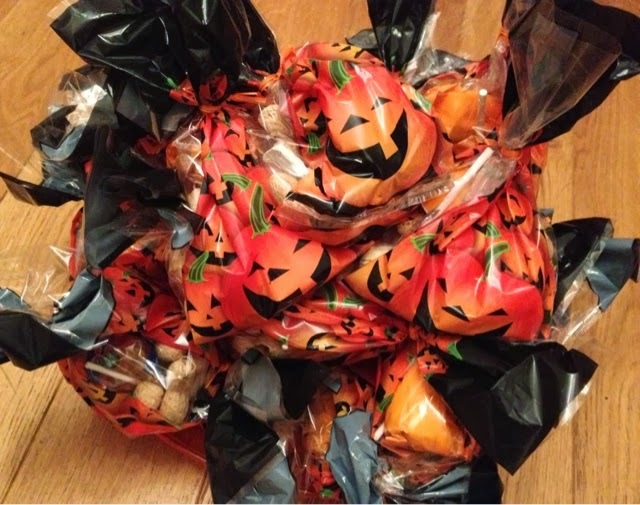 The goodie bags are all ready and boy and girl have their costumes looked out. 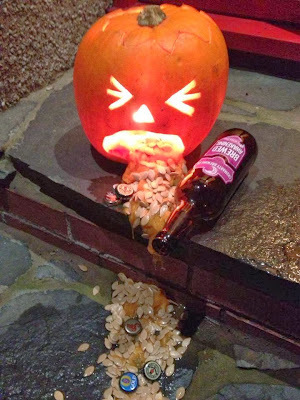 Have a Happy Halloween however you celebrate. 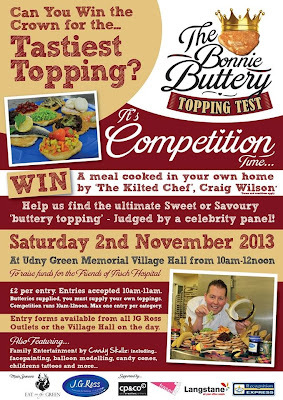 I'll be heading to a Christmas Cookery Class. I kid you not. 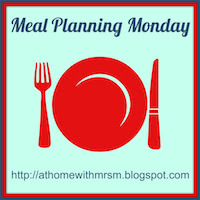 Mincemeat and Sage & Sausagemeat Stuffing is on my menu for tomorrow night. ETA Here he is, late to the party. The "Drunkin Pumpkin"
We hadn't even left Aberdeenshire when it was time for our first stop. Brunch at the Pitstop Bus Cafe. 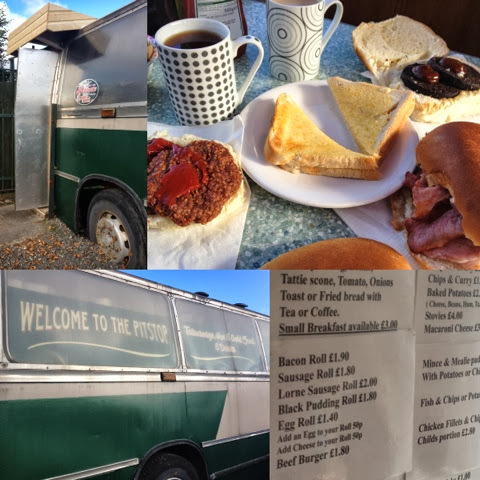 This isn't your usual roadside cafe by any stretch of the imagination but I'd take it over a motorway service station any day of the week. 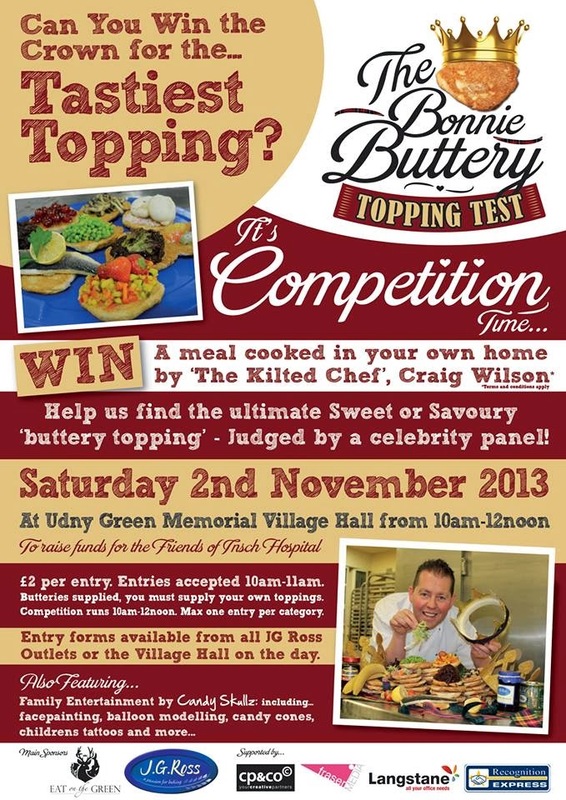 Its on the A96 between Inverurie and Huntly close to Pitcaple and always seems really busy. Nothing fancy but good basic food at bargain prices. Boy and girl loved it and wanted to stay for lunch. Will definitely be pulling into the Pitstop for a refuel again. 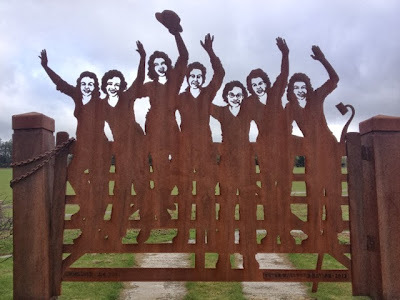 Next stop was at a memorial I hadn't even heard of until a week previously when I spotted a photo of it on a friends Facebook page. 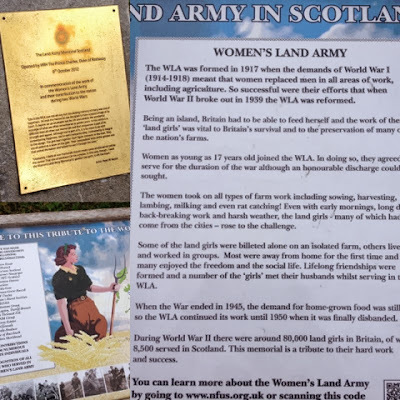 The Women's Land Army Memorial Scotland is located in Clochan a wee village close to Fochabers. It was opened last year by Prince Charles and pays tribute to a much under recognised but vital part of our war efforts. Without the Land Girls, Britain would surely have starved. Final stop enroute was for an afternoon cuppie and fine pieces at Brodie Countryfare. 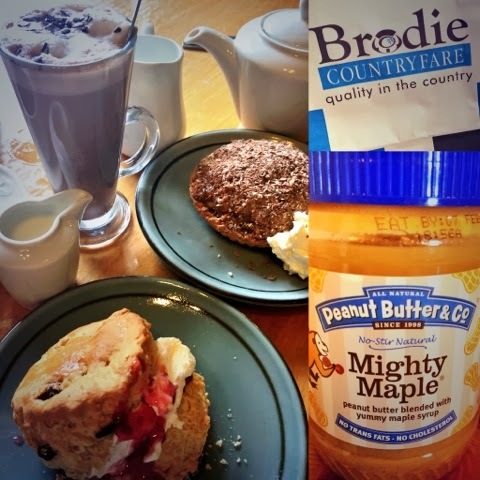 A couple of sneaky purchases from the shop including an awesome imported Peanut Butter and Maple Syrup combo. A morning walk with my Dad as my guide led us round Redcastle Estate on The Black Isle. What a bumper crop of wild harvest on show. 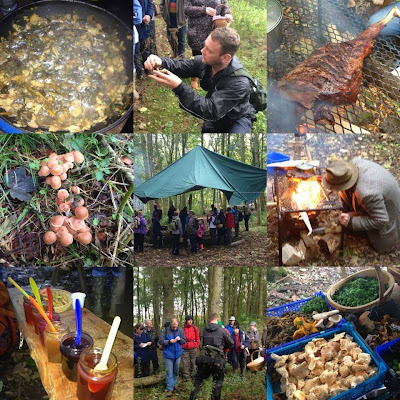 No foraging undertaken on this occasions but lots of apples, rosehips, brambles, hawthorn berries and elder berries. 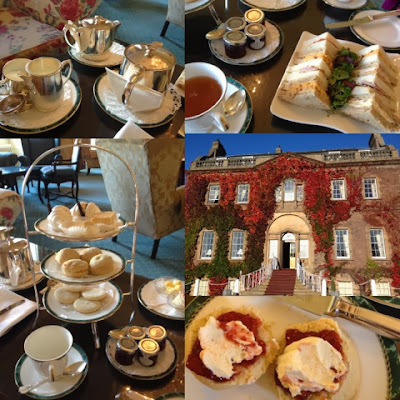 Quality time in the afternoon with my mum when we headed to Culloden House Hotel for Afternoon Tea. 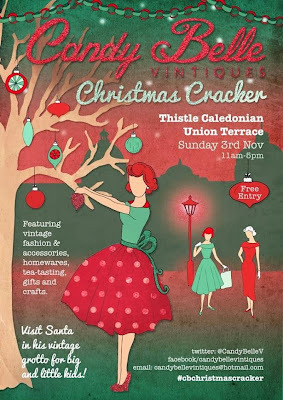 I had won a voucher for this in a raffle at the launch of the EightByEight Project back in April. Lovely surroundings, staff and temptingly tasty treats. 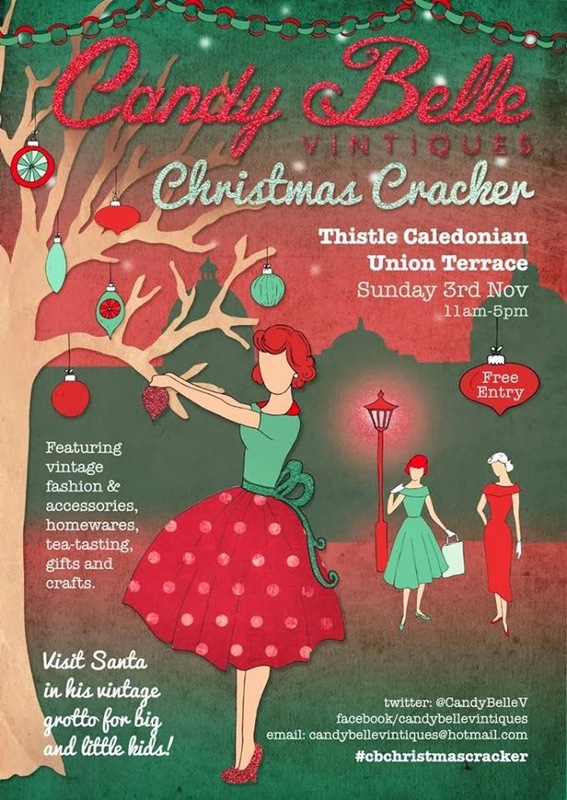 The shortbread was particularly good although the overall look of the cakestand was rather "beige". More colour required for afternoon tea perfection. 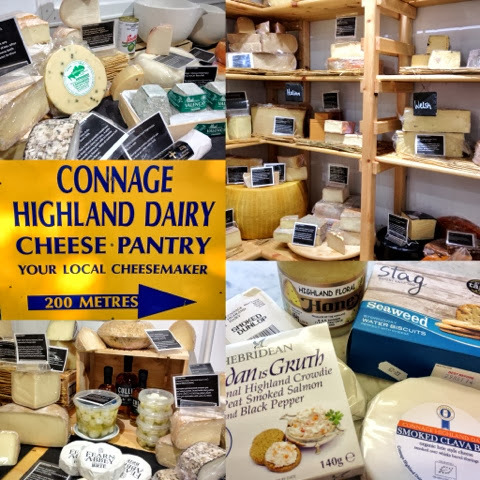 Whilst we were out and about we headed to Connage Highland Dairy at Arderseir. Amazing range of their own cheeses and others from around the world. Lovely looking little cafe too. Should have checked if they perhaps do the elusive Cheese Afternoon Tea of which I seek. 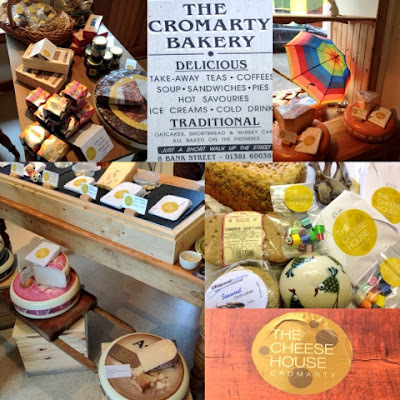 Cheesy purchases were made including their smoked brie, crowdie and smoked dunlop. I did cause some consternation when I tweeted that we were going on a dolphin hunt as part of our #HighlandFoodieRoadTrip but rest assured I had absolutely no intention of eating any. On our trip with Ecoventures in Cromarty the dolphins were very elusive and we were headed back to the harbour somewhat crestfallen when they put in a last minute appearance. What a marvelous experience to see them up close. Alas my poor nature photography skills don't do them justice. Hot drinks all round were required to warm us up at Sutor Creek Cafe before we tucked into fantastic pizza made in a wood fired oven. 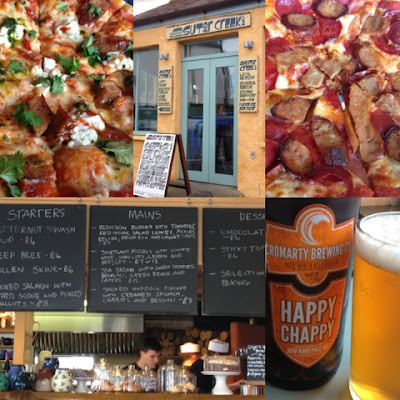 Great range of toppings (no dolphin) on offer and some Happy Chappy from Cromarty Brewing Co to wash it all down. Even did a bit of celebrity spotting as crime author Ian Rankin has a house in the village and came in for lunch. He had the soup. Fab foodie finds on our wander through the rest of the old town. Dutch Cheeses, oatcakes, chocolate dolphins and papabubble candies from The Cheese House. Quirky salt shaker from Cromarty Pottery and Pumpkin Seed Bread and Cinnamon Biscuits from Cromarty Bakery. Lunch for one was required following a meeting in Inverness and a Bicycle Workshop come Cafe had been recommended to me. 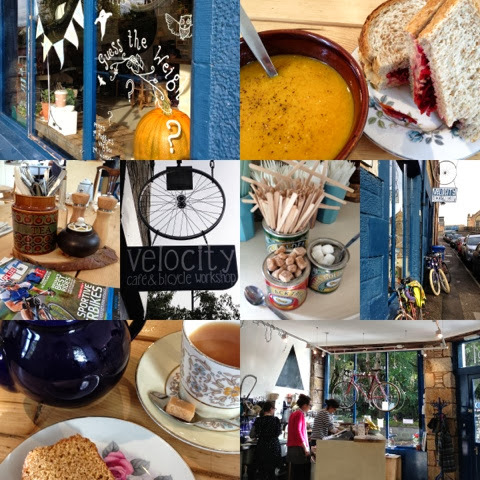 Velocity sounded right up my street and did not disappoint. 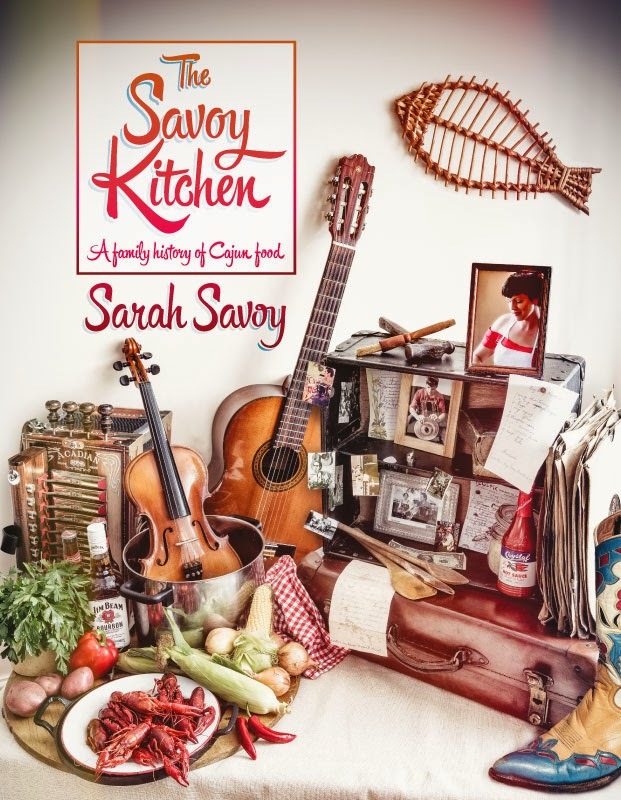 Quirky decor, retro crockery, friendly staff and great food. They even let me taste the soup to see if I liked it. Such a good vibe in this place and lovely to hear the clinking, clunking and tinkering going on in the workshop. I must find out how heavy that pumpkin was as I really didn't have a clue so never left a guess. Time for some foraging and we headed off to find Hazelnuts. Alas I don't think I'm going to be going into competition with Nutella any time soon. Very labour intensive. 4 people + 1 hour = not many nuts. 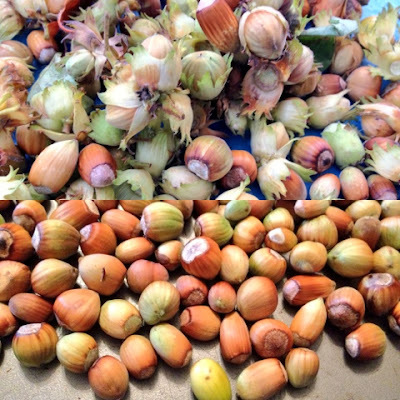 Think the squirrels bet us to them. 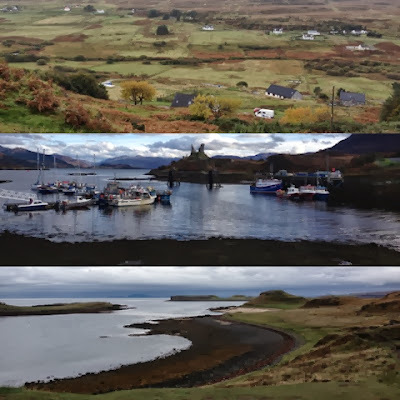 3 day jump at this point as we left the kids and headed to Skye for the weekend. You can read all about that bit of our #HighlandFoodieRoadTrip on this post I've Just Come Back From The Isle Of Skye We had an absolutely wonderful time. Back to the mainland and with Foodie Loon dispatched back to work we made the most of our last couple of days. 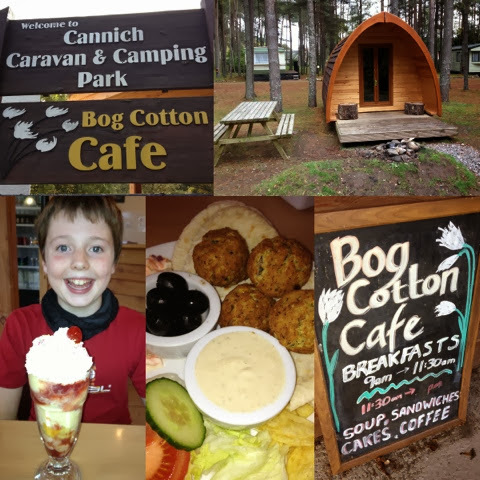 A drive through some beautiful autumnal trees took us to Bog Cotton Cafe at Cannich. A fab setting at the head of Glen Affric. Tree Creepers and Woodpecker spotted on the bird feeders outside the cafe and Knickerbocker Glory Guzzlers within. Big thanks for the takeaway portion of fabulous Tahini salad dressing. We'll be definitely back at some point to stay in a Pod. 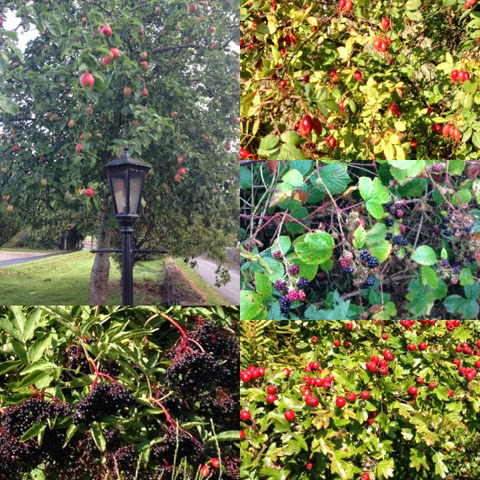 A wee bit more foraging with a bumper crop of apples and crab apples at the roadside. 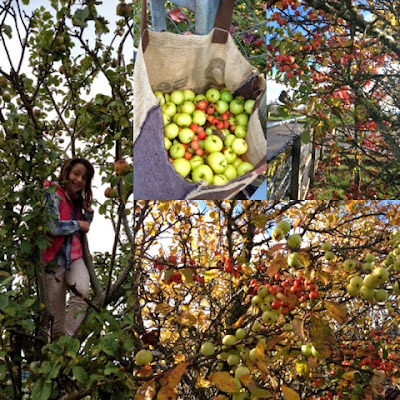 Small child sent up the tree to pick apples with no regard for health and safety. However the crab apples were actually much more dangerous as they were so plentiful and ripe they were falling on our heads. The self preservation society will be heading into action once again. 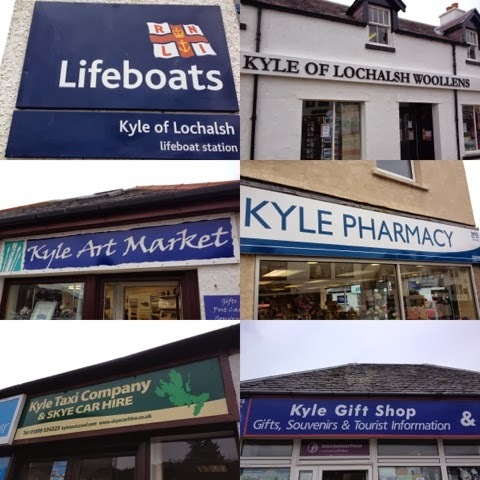 A couple of lovely shops in Beauly were visited on our way back form Cannich and purchases made. 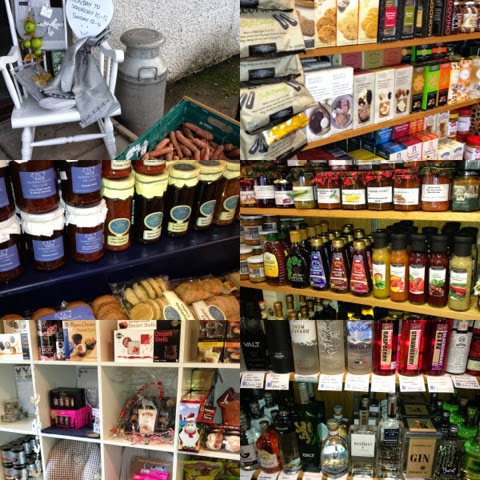 Robertson Larder Farm Shop and Corner on The Square both had a veritable bounty on their shelves for foodies. Last outing before we headed home was to The Storehouse for Coffee and Cake. Girl accompanied me and she had a chocolate brownie whilst I had a huge slice of lime and coconut cake (diet starts on Monday!) When he saw the photos of the giant meringues boy wished he had joined us. 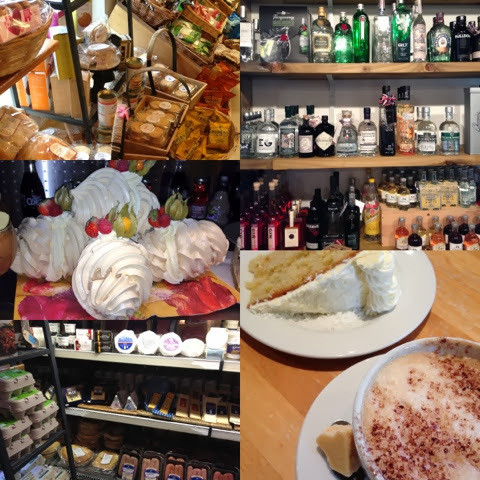 Lots of lovely items in the shop and a particularly good selection of gins. #HighlandFoodieRoadTrip over but what a fantastic bunch of edible souvenirs Alas not all pictured as some already long gone (namely the cheese mountain) We had a fantastic time exploring only a small portion of whats on offer in the area. So lucky with the weather too which enabled us to get out and about. 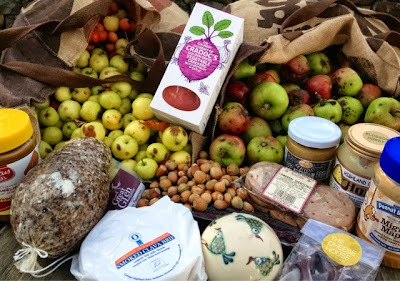 Who needs to go abroad for their holidays when we have the fantastic produce of Scotland on our doorstep. What a fantastic weekend in Skye we've just had. The highlight of the trip undoubtedly being staying and eating at The Three Chimneys encompassing The House Over By, 7 Courses of Skye and The Kitchen Table. 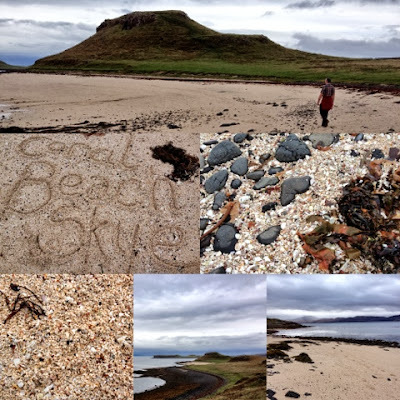 But that deserves a whole upcoming blog post of its own so this one just covers everything else that lies over the sea to Skye. We were heading to the west from The Black Isle having left boy and girl behind with their grandparents. 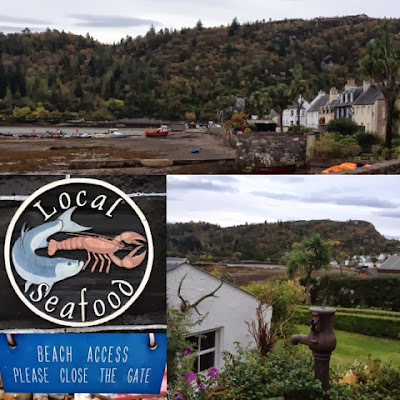 Our first stop enroute was in Plockton considered by many to be the jewel in the Highlands. Its a quaint village with seaside cottages, palm trees, fishing boats and plenty of charm. 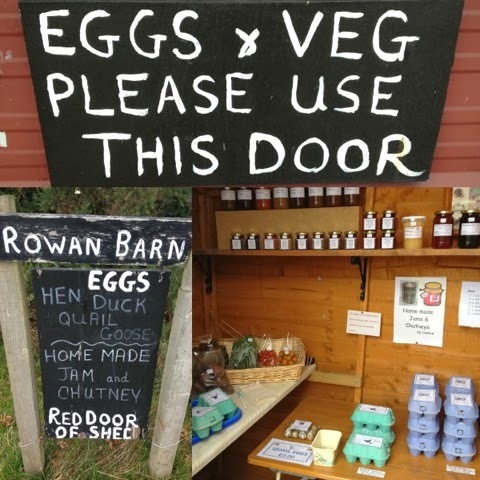 Throughout our whole trip there was an abundance of "Eggs for Sale" signs complete with honesty boxes at the roadside. The one at Rowan Barn in Plockton in particular caught my eye with the promise of duck, quail and goose in addition to hens eggs. 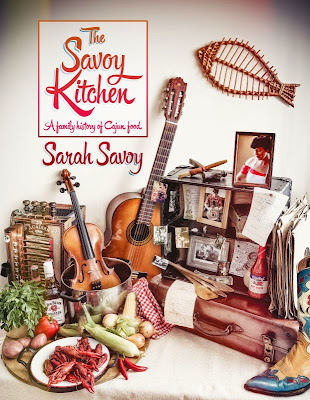 A veritable farmers market of preserves and veggies lay behind the red door but alas no duck or goose eggs but we did get the last of the quail. A whistlestop tour of Kyle of Lochalsh before crossing over the sea to Skye. In real life Boy is called Kyle so there were some photo opportunities to be had to keep him happy. In anticipation of our evening meal encompassing Seven Courses of Skye we opted for a picnic lunch looking out over the Skye Bridge. 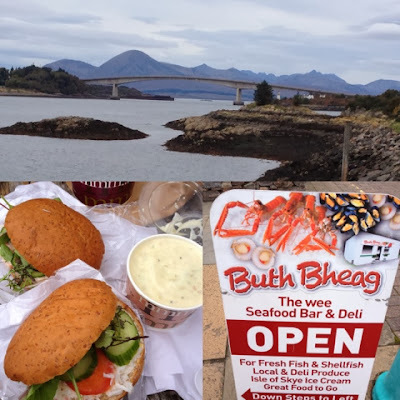 Crab Sandwiches and Cullen Skink from the busy wee Buth Bheag Seafood Bar and Deli hit the spot perfectly. 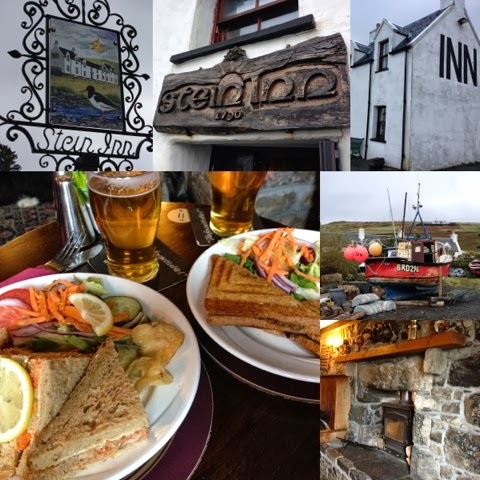 It was Foodie Loon's first visit to Skye and I haven't been for many a year with any previous occassions by ferry. So it was a first trip over the Skye Brdge for us both. First stop was at Talisker Distillery. Neither of us are actually Whisky fans but it felt rude to at least not pop in past and see Skye's only distillery. Big jump in timescale now to avoid our Three Chimneys experience and continue on our road trip. In our room over by were some beautiful cushions made by Skye Weavers so we wanted to seek them out. Totally worth a visit to the weaving shed to see the bicycle powered loom. I even got to have a go. The whole process was fascinating as was Rodger the weaver. Unfortunately their shop was somewhat bare as his wife was at a wool and textile fair in Inverness with the majority of their stock. I shall need to make a return visit for a cushion. A Three Chimneys influence also led us to our next stop at Coral Beach. The scallop course the previous evening was served in a shell on top of "sand" from this fascinating beach. The beach is formed of dried calcified sea weed and tiny shells. I will confess to taking a handful home in my pocket. 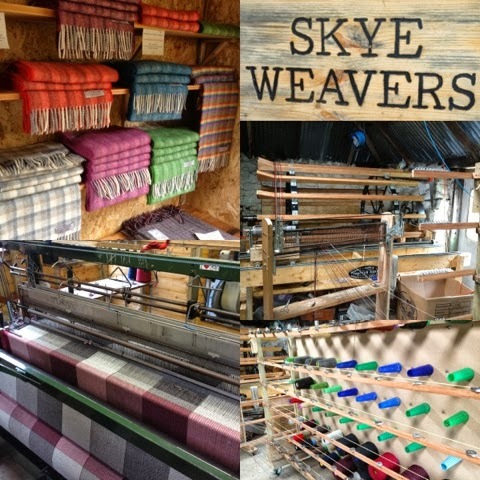 Skye Skyns was a recommendation from fellow guests at the kitchen table and it didn't disappoint An interesting insight into the workings of a Tannery downstairs with a tempting showroom of sheepskin goodies upstairs. The huge mosaic rugs were beautiful but a wee bit outwith our budget. 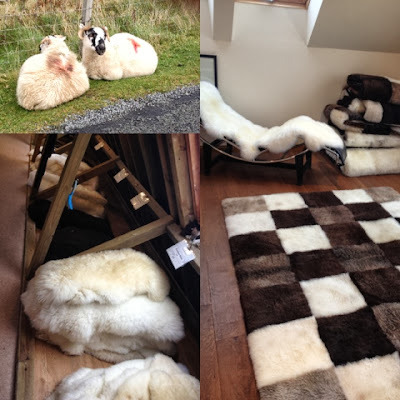 We did however purchase a gorgeous single blackface lambskin. Stein Inn is the oldest on Skye and was our stopping off point for a late lunch of Crab Sandwiches and Haggis & Beer toasties washed down with some local beer. 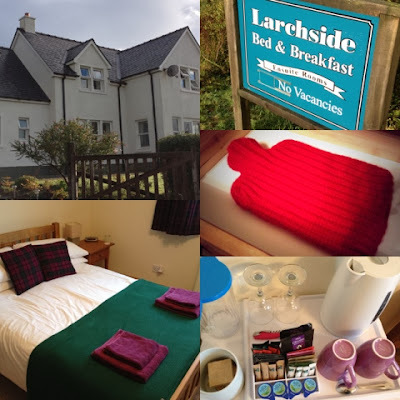 Our second night on Skye was spent at the Larchside B&B overlooking Portree. 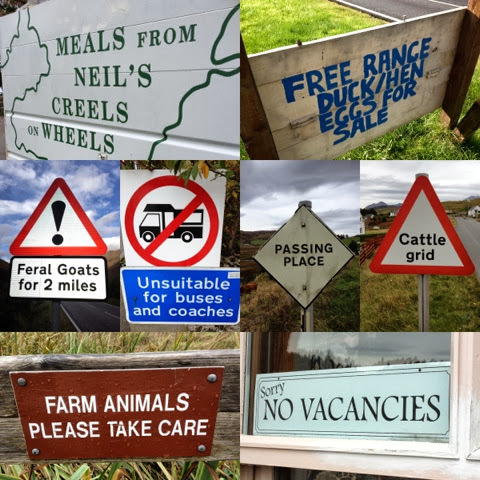 Our hosts Craig and Kasia couldn't have been more hospitable from a hot water bottle in the drawer, homemade shortbread, a list of suggested places to visit complete with maps and a wealth of local information. We hadn't booked anywhere to eat that night but Craig suggested The Granary and managed to squeeze us in a last minute reservation. 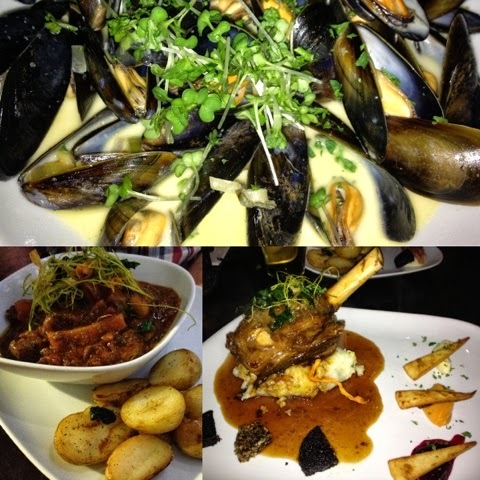 We both had mussels to start with followed by Game Casserole with Venison, Hare and Pheasant and Isle of Skye Lamb Shank. 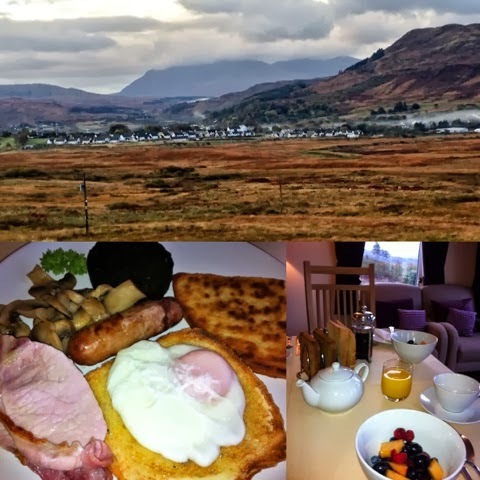 Fantastic views from our breakfast room the following morning with a full Scottish breakfast to match. We shared our table with a family of four and a couple from Australia on a backpacking world tour. 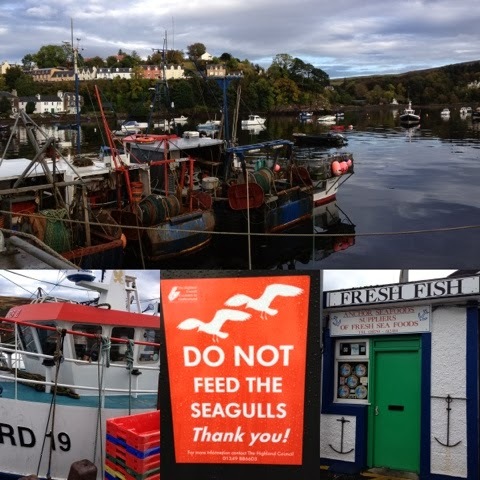 Alas no shops were open in Portree on the Sabbath but we had an enjoyable walk round the Harbour taking in the sights and sounds. 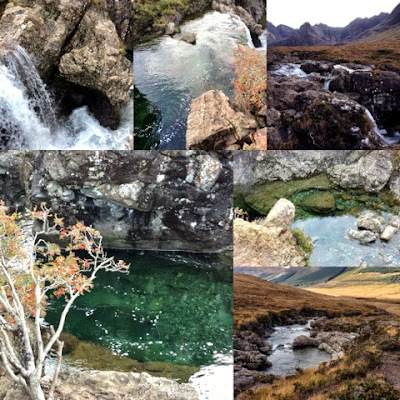 Last stop before heading back to the mainland was the Fairy Pools. These comprise of a string of waterfalls interlinked with the most amazingly clear and still pools. I can well believe the aqua pools could be the home of fairy's. Truly a magical spot. 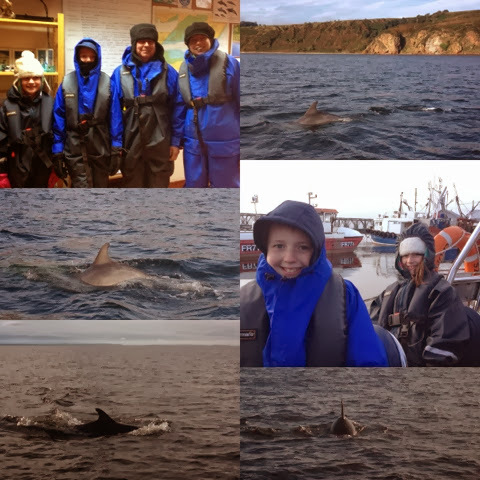 Time to head back to the mainland with lots of fantastic memories from our trip and a few souvenirs. Still so many places that we didn't have time to visit so there will definitely be a return trip. Claire MacDonald's Kinloch Lodge is next on my bucket list. 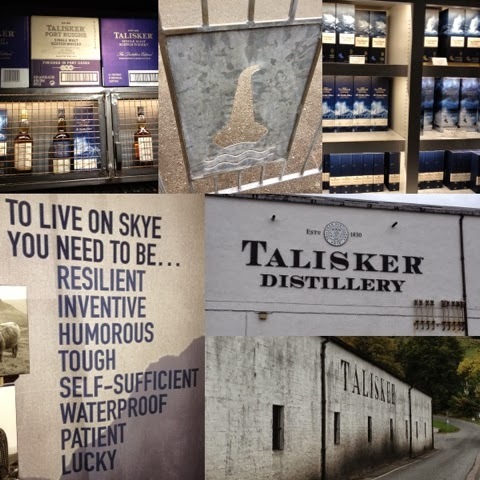 The sign we encountered at Talisker Distillery summarised our Skye experience perfectly.